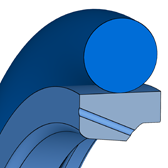 Two-component Merkel seal set for sealing piston rods, consisting of one PTFE profile ring with integrated pressure-relief function and an elastomer ring as pre-load component. Patented product design (patent no. 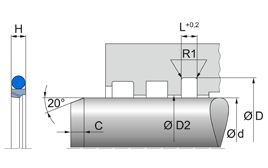 : DE 10117662 CI). Can be exchanged with operating environments of the Merkel Omegat OMS-MR Series.